At Magnolia Home Care Service, the safety, comfort, and overall welfare of our clients are our top priorities. We recognize that most people prefer to age, heal, and recover in the comfort of their own home—with our help, we can make that possible. With our compassionate, highly trained caregivers and a wide array of home care services in Savannah, Georgia, we endeavor to improve our client’s quality of life. Recovering after surgery in your home can limit you from doing your daily activities. Whether you are recovering from major surgery, childbirth, or plastic surgery, our compassionate caregivers can assist you on a healthy and complete recovery. Arthritis, physical disabilities, and age-related conditions are some of the few circumstances that prevent patients from caring for themselves. Our caregivers can assist you with daily tasks, such as mobility, eating, exercising, and grooming. We understand the anticipation and urgency of waiting to be discharged from a facility so as to make it to the comfortable boundaries of your own home. In most cases, discharges require a family member/friend to transport them from the facility to home. How often do you have to wait on that family member/friend to pick you up? It could be hours, even the next day. We are here to help reduce that wait time. Our non-medical transportation services will get you to your comfortable bed sooner! No matter what your situation may be, we can handle all of your non-medical home care needs. We offer home care services that are versatile, flexible, and customized for your comfort, peace of mind, and well-being. Services performed by or under the supervision of a licensed or certified nurse to treat your injury or illness. Services you may receive include medication management, tube feedings, catheter changes, observation and assessment of your condition, management and evaluation of your care plan, and wound care. 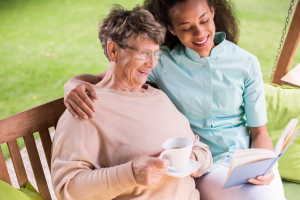 When it comes to compassionate, personalized home care services, there’s no one more equipped to help you than Magnolia Home Care Service. If you would like to set up a meeting with our caregivers, or if you have further inquiries about our services, give us a call at 912-319-7273 / 912-507-3514 (Emergency After-Hours) for assistance.